DORAL, Fla. (AP) — A fitness buff carrying an American flag and shouting about President Donald Trump stormed the hotel lobby of Trump’s Miami-area golf resort early Friday and opened fire at a chandelier. He then waited for police to arrive, and exchanged gunfire with officers who shot him in the legs and arrested him. 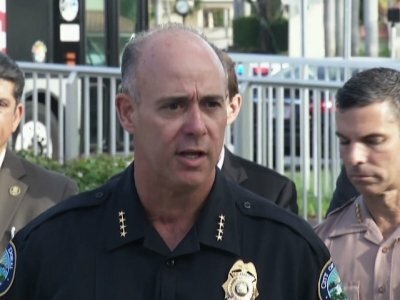 The motive for the shooting at Trump National Doral Golf Club around 1:30 a.m. was not immediately clear, but Miami-Dade Police Director Juan Perez said the man pointed his gun at several people and shouted “anti-Trump” rhetoric before waiting for police to confront him. “We don’t know what his intentions were in the long term, but we know what he was doing at the time — he was trying to engage our police officers in some kind of ambush-type attack,” Perez said. One responding officer broke a wrist, but no resort employees or guests were hurt. Trump was not at the suburban golf resort at the time. Perez identified the suspect as 42-year-old Jonathan Oddi, who lives in a condo building about a mile (2 kilometers) away. He said Oddi took a flag from a flagpole at the resort and draped it over the counter in the lobby, where he pointed his gun at several people but only fired into the ceiling and light fixtures overhead until police officers arrived. Oddi was expected to face various criminal charges. Video footage showed the conscious suspect being wheeled into a hospital on a gurney, and Miami-Dade Police spokesman Alvaro Zabaleta said Oddi remained hospitalized in good condition Friday afternoon. Oddi’s attorney, Rae Shearn, said her client was a fitness instructor. She said it was too early to say anything more. “I am conducting my own investigation and have no statement in regards to what occurred or what didn’t occur or what may have precipitated that event,” she said by phone. Oddi’s neighbors woke up Friday morning to police tape blocking a driveway to their building, and officers and media gathered at its entrances. “You never know who is living next door to you. It is sad and shocking,” Diaz said. Oddi worked as a dancer and entertainer, owns a small dog, and was born in South Africa and grew up in Argentina, one friend, Luis David Gonzalez, told the Miami Herald and the Sun Sentinel newspapers. Gonzalez, who said he worked out with Oddi every day, was bringing coffee and eggs to Oddi on Friday morning when he heard the news. Court records in Miami-Dade and Broward counties show a slew of misdemeanor traffic infractions for Oddi, but no felony arrests. The Secret Service issued a statement saying its agents were at the scene and working closely with other agencies. “No Secret Service protectees or security operations were impacted as a result of the shooting,” it said. The large Trump-owned golf facility in the growing suburb was surrounded by a heavy police presence, its entrances blocked with yellow police tape and by patrol vehicles throughout the day. No resort employees or guests were injured, said Doral Mayor Juan Carlos Bermudez. The Trump National Doral, which includes an expansive clubhouse, is among the largest hotels in the Miami suburb sandwiched between Miami International Airport and the Florida Everglades. Its website describes it as an 800-acre resort with 643 total guest rooms and four golf courses. The Trump organization purchased the resort in 2012. PGA Tour Commissioner Tim Finchem said the move had nothing to do with politics, only finances. Cadillac did not renew its title sponsorship of the event, and no other sponsor wanting to be at Doral was found, Finchem said. Associated Press writer Jeff Martin in Atlanta contributed to this story.